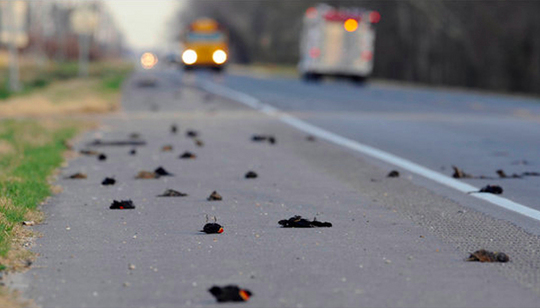 It all seemingly began around midnight on December 31, 2010 through January 1, 2011 when over 5,000 red-winged blackbirds and starlings fell out of the sky in Beebe, Arkansas, USA. It happened in an instant and the birds were dead by the time they hit the ground. In the days that followed, there were a handful of similar incidents. The mainstream media took note but their reporting of these events was anything but objective. Instead, reporters could often barely contain their snickering as they took advantage of the newly found interest in rapture mania and many jokes were made about the biblically prophesied end times. When the laughing subsided and the people lost interest, the media moved on to other seemingly more important news. However, the beginning of January, 2011 was far from the end of the story. This was not the beginning of the story either. It was just the point when we first started to notice an ever accelerating number of mass animal die-offs. About ten days before this, thousands of crows, pidgins and various other birds also literally fell out of the sky in Esperance, Australia. Before that, on November 2, 2010 thousands of sea birds were found dead in Tasmania, Australia. The mass deaths of so many animals, is truly tragic. Could this have been a warning to humanity from God? I believe it was so. All of these birds, animals and marine life certainly did not die from any disease. They fell dead from the sky, on land and in the sea in a moment, as if God had snapped His finger. Animals, birds, and marine life are innocent of the sins of men. The deaths of tens of thousands of innocent birds, animals and marine life (dolphins, turtles, whales, sharks and fishes) for that matter, because of the sins of mankind is a huge tragedy. It is a tragedy in much the same way that it was a huge tragedy when the Son of God, who was innocent of the sins of mankind, suffered and died a horrible death in our place. 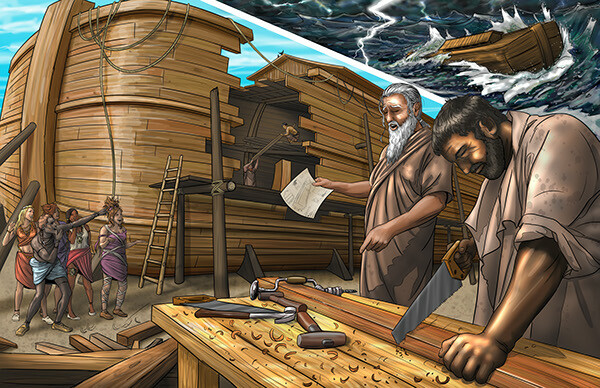 In the days of Noah, everybody had a good laugh at the idiot building a huge ship and then moved on with their lives. Nobody took it seriously. The same thing happened in early 2011. Media coverage biased as it was stopped, when the laughing stopped. 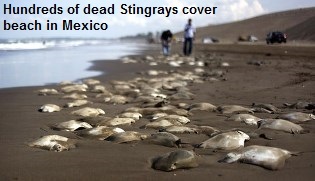 Nevertheless, animals, birds and marine lie continued to drop dead or floated in our oceans by the tens of thousands. Imagine for a moment how sad these 133 incidents of death truly are. The total number of dead birds, animals and marine life will never be known. There were just too many to count. I am not talking about 133 dead animals; I am talking about 133 separate incidents of mass death of animals. During 2012 the number of incidents accelerated from 133 to 465 known mass animal die-offs that occurred in 67 countries around the world. These statistics are staggering. Reading this I was filled with a profound sense of sadness at what happened. Do these tens of thousands of animals know why their lives had to be forfeited? Can they comprehend how unfair it is that they pay such an enormous penalty for wrongs they did not commit? Why does humanity seemingly feel no remorse for what has happened so far? God is shouting from the balcony of heaven a warning at us. Why is it that nobody seems to hear? According to the Bible, what is happening now in the animal kingdom is about to happen to mankind. I believe that it is happening worldwide because God is giving us a preview of what is to befall man. As of February 6, 2014 just seven weeks into the New Year, there have been 79 known cases of animal die-off events occurring in 25 countries. Apparently the rate of acceleration continues to increase rather than to decrease. Would it be logical to assume that the mass death events in the animal kingdom would be a sign of the approaching apocalypse? The Book of Revelation tells us that the horseman on the black horse in chapter 6 brings famine upon the world and that death and Hades follow him. We certainly rely on the animal kingdom for food. One could, therefore, assume that the stage is being set for this rider. Upon further reflection, we see that the entire world’s food supply is currently being threatened by extremes in weather. In fact our weather is more than just extreme, it is downright freakish. Radiation escaping from the melted reactor at Fukushima is spreading around the Northern Hemisphere and in the process is contaminating the world’s food supply. The thousands of tons of radioactive water released into the Pacific Ocean, has affected and contaminated marine life; to what extend we do not know. We know it had reached the United States but what about Asia? Who is monitoring the marine life in this area? Are the seafood we are consuming now toxic? We are only now beginning to comprehend the enormity of this nuclear fallout. Honey bees are absolutely necessary for pollination of food producing plants and the worldwide population of these bees has been badly decimated by an unknown force in recent years. Bats play a vital role in the control of insects that attack our food supplies. Bat populations throughout the world have also been severely decimated by an unknown source. 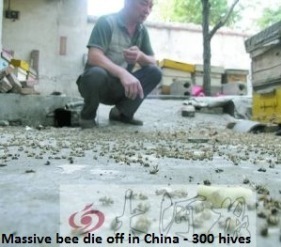 In some locations, the bees and bats have all but disappeared. What’s going on? Perhaps the stage is already set and we are just waiting for the actors to take their place so that the show can begin. The cause of the vast majority of mass animal die-off is unknown. Scientists and government agencies looking into this phenomenon just don’t know why it’s happening, especially when research shows that these animals, birds and fishes are perfectly health when they died. Skeptics attempt to downplay the significance of a few of these events by putting forth pitifully absurd explanations, claiming that this kind of carnage in nature is natural. The Bible makes no mention as to whether or not we would know the mechanism by which God would cause these animals to die. The Bible merely says that animals would die in the last days. They died. Prophesy fulfilled. Have we become so numb to the preponderance of end-time signs that we no longer see them, or are we afraid of what these signs portend that we refuse to see them? Anybody who has not sort Jesus as their Savior and Lord should be frightened; very, very frightened. I know there will be those who disagree with this assessment. I know what’s coming and what my position with regards to the Rapture is. I get a sense that the vast majority of people just cannot be bothered. That’s their choice and choices have consequences. From everything I have found thus far while studying end-time scriptures, I am convinced that the Rapture of the church will occur before the seven-year Tribulation, which the Bible tells us will occur before the Second Coming of our Lord. I am not setting any dates but if this is true and the stage is now set for the horsemen of the apocalypse to ride forth, then the Rapture of the Church will truly happen at any moment. All we are waiting for is God’s timing. Those who believe in the promise Jesus made to us have no reason to be afraid. He has used the analogy of the Jewish wedding traditions to assure us that we are His and that we have not been appointed to suffer God’s wrath in judgment. Instead of suffering, God has bestowed upon us the privilege of being witnesses to the end of the age. I often wonder if departed friends and relatives who are now in heaven will someday be a little envious of those of us who were here and were able to see in person how it all ended. God is currently shouting a warning at mankind and His shouts are growing progressively louder. But Jesus did say that the people in the last days would be behaving like those in the days of Noah. Total absorbed in their personal and daily routines and took absolutely no note of what is about to befall them, including Christians. Perhaps Dr. Billy Graham is right that 95% of the people who now sit in our churches are not genuinely born again and probably will not make it. The animals are dying. God’s warning to us is an example in the animal kingdom of what will soon happen to humanity. There is no doubt that the world is in danger of being destroyed by man's bad decisions and the signs are there as described in the Bible but in the midst of the chaos, do we sit around waiting for God to return, or do we go and preach the Good News to all? Do we reject those who refuse to hear, or do we continue to love them as they are also God's creation?